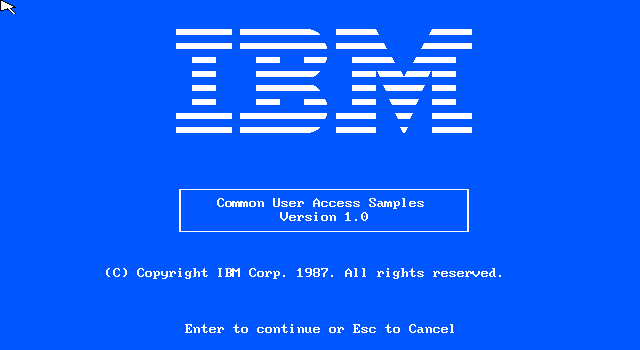 IBM's "Common User Access" was a set of specifications designed jointly with Microsoft as a guideline for a standardized user interface across a wide variety of software products, both for the PC and IBM mainframes. 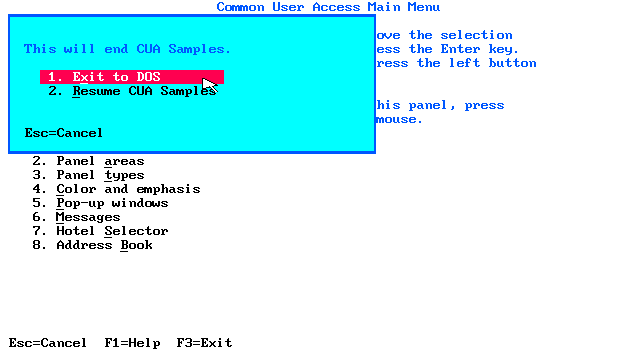 This sample program system contains sort of a guided tour through several mockup programs implemented using the CUA defined interface. 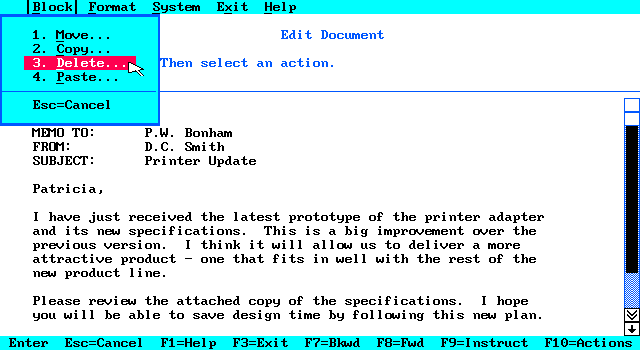 This revision was released in 1987, about the same time as Microsoft Windows 2, and has some visual similarities. 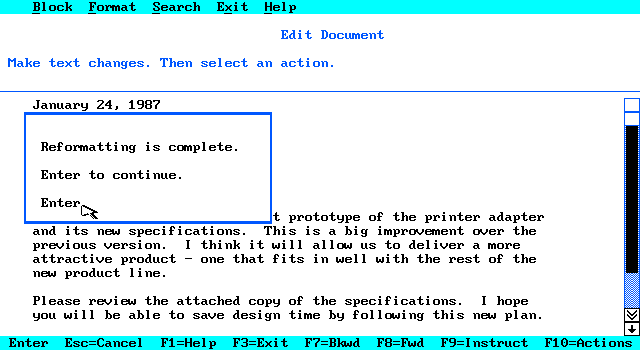 Some of the similarities remain in current Windows products. Of course, quite a bit is reminiscent of the 1983 Apple Lisa and 1984 Apple Macintosh. Later revisions of this specification were released, however after the IBM-Microsoft breakup they became increasingly irrelevant. The mockups and the application itself are rather crude. It can display using EGA graphics, CGA graphics, or text-only terminal mode. Therefore the interface elements scale to the lowest common denominator. The mouse cursor is buggy, wrapping around the side of the screen. The terminology is a little different here. Each screen is referred to as a "panel". 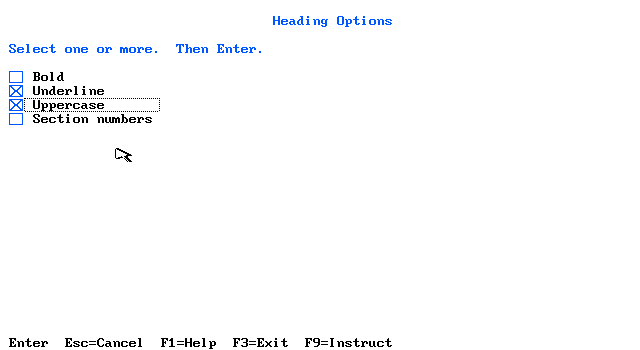 In these samples, the primary application panel is not windowed or multi-tasking, similar to a typical DOS program. "Action Bar" refers to the menu bar at the top of the screen. "Panel body" is the term for the main content. 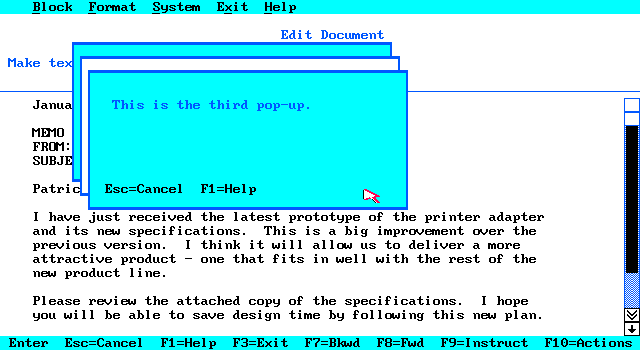 "Pop-up" is content or dialog that appears in a window over the Panel. "Scroll Bar" - Similar to a modern scroll bar, it is an area with a draggable visually "raised" bar in the middle, somewhat proportional to the scrollable area. The single arrow on each end is supposed to allow scrolling a single line, while the double arrow scrolls multiple lines. "Function Key Area" is the bar at the bottom listing currently applicable function keys. You can use the mouse to click on these like "softkeys" (a term used elsewhere).. Remember, the keyboard is king. Toy touch screen users will be smacked upside the head with an IBM Model M clicky keyboard. Voice users will have the same Model M shoved down their throat. The first demonstration, is how to use the "Action Bar". It behaves like a fairly typical drop down menu. 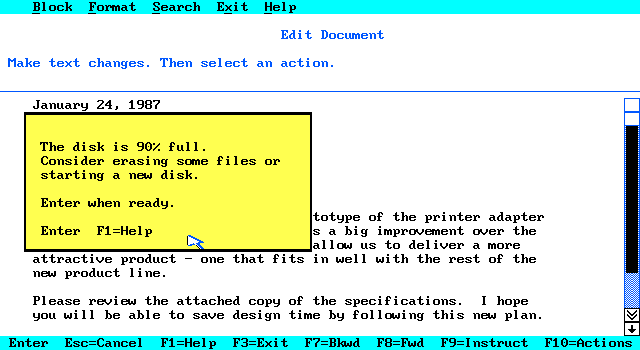 Keyboard usage requires you to press F10, and then the underlined letter or arrow keys. There are no "Alt" hotkeys. Escape closes the drop down. Then it demonstrates how to use the "Panel Body", which is specific to an application. 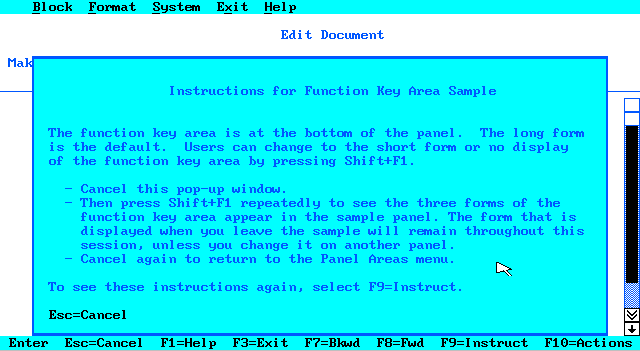 The final part of a "panel" is the Function Key Area. 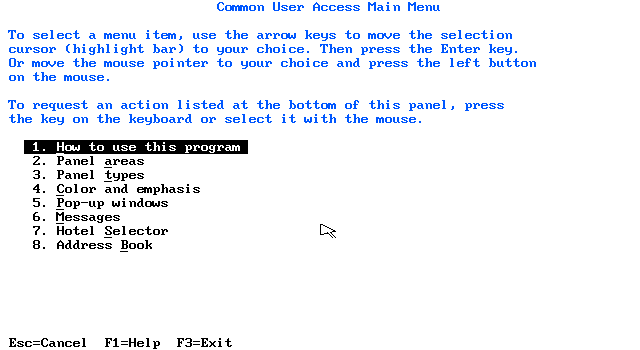 The program demonstrates the ability to change or hide the function key area. 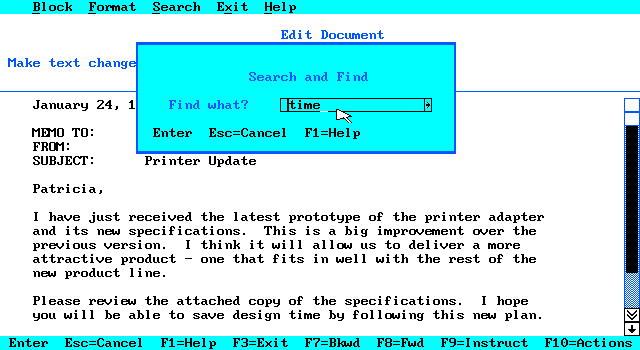 A few of these are still present in some Windows applications: F1 launches help, F5 refreshes content, F6 moves selection between window body and URL bar, F10 sets focus on a window's menu. 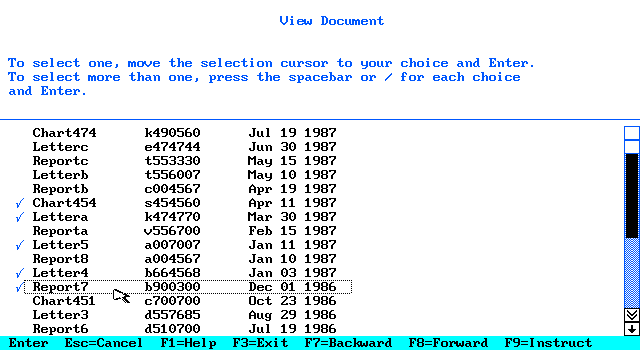 F3 was used to exit Windows setup. The next demonstration is a list of "Panel Types". These are screen layouts that you might see when a program starts, or non-windowed dialog. 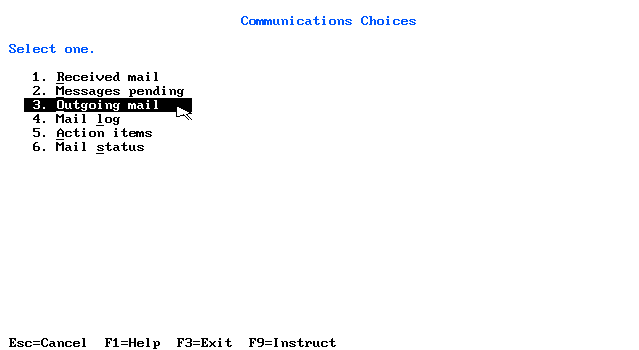 "Single choice, numbered list" - a simple numbed list like many DOS menus. "Multiple choice, check boxes" - a similar menu, but you may select more than one option. "Extended choice" - This is a selectable list, where space toggles multiple selections. And finally, "Text Choice" - Text boxes in which you may enter anything. Pressing tab moves to next field. While the idea of using an entire screen or application window as a menu is not too common in a windowed environment (probably made a comeback on mobile crap), these demonstrate the use of checkboxes, radio buttons, and text boxes. Next, it attempts to describe the use of color pallets in a CUA application. - Main panel content color. - Emphasis colors for action menu items. 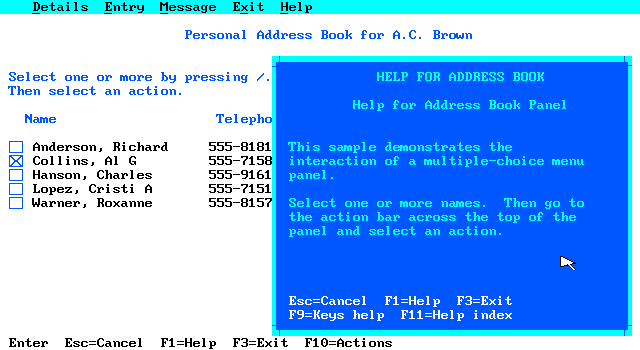 - Different colors for the help window. It seems to suggest that overlapping pop-up windows should have alternating colors, as shown above. It also demonstrates some more complicated pop-up dialogs. The dialogs in these samples do not use graphical buttons or windowing controls. This is likely because these represent both GUI and text-based applications. 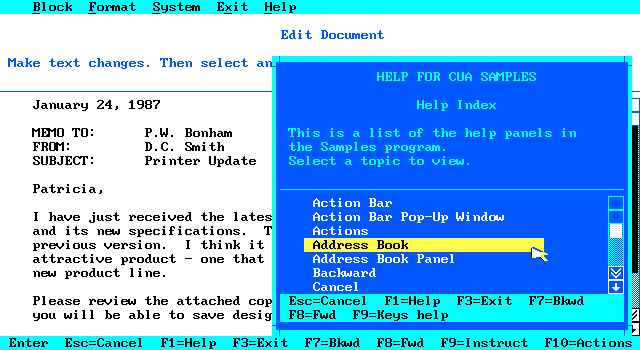 The sample programs also implement an example help system. It has an index, multiple topics, and scrollable content. Notice that the help window appears as if it should be movable or resizable. However this mock-up does not implement any windowing control.. The system defines three different kind of pop-up. The first is a "Notification" pop-up. On a color display, this appears white. The second is a "Warning" popup. On a color display, this appears yellow. The third is a "Critical" popup. On a color display, this appears red. The only visible difference seems to be the color. In monochrome CGA mode, they look the same. Because these samples are text oriented, they do not use graphical icons. Regardless of how the popup windows are styled, the classifications are important. A specific application environment could chose to use other output (such as sounds, icons, or dialog titles) or user input handling, but it should be consistent for each class. After the walk through, the software includes two additional mock-up applications that you may explore freely. 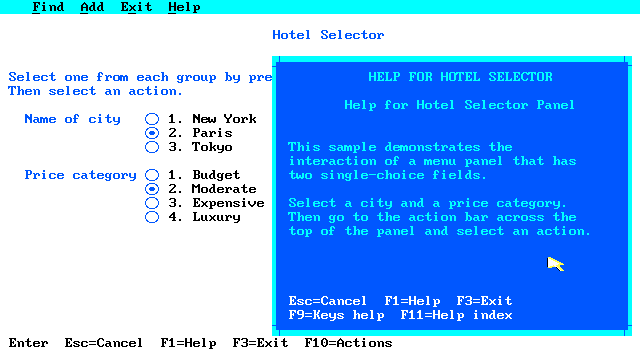 A "Hotel Selector" database, and a "Personal Address Book". However, these applications don't really demonstrate the best behaviors. 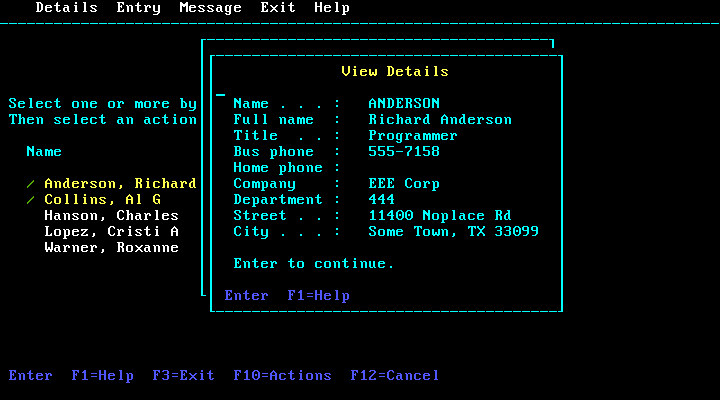 For example, the address book will open a pop-up window for every name you select. If you start the CUA sample program in terminal mode, you can see why there are minimal graphics. 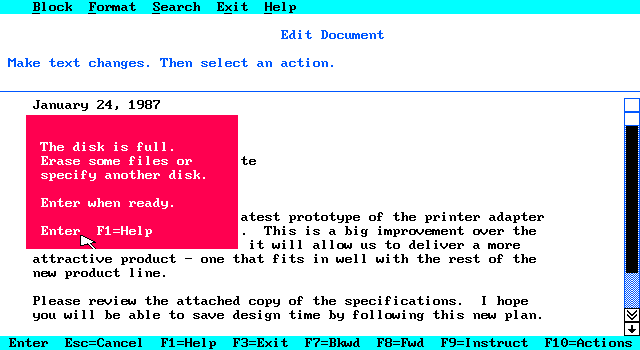 In this mode, the entire user interface is text-based, and does not use the mouse. The keyboard usage is bizarre as it requires using the control key instead of "Enter", and "F12" instead of Escape. 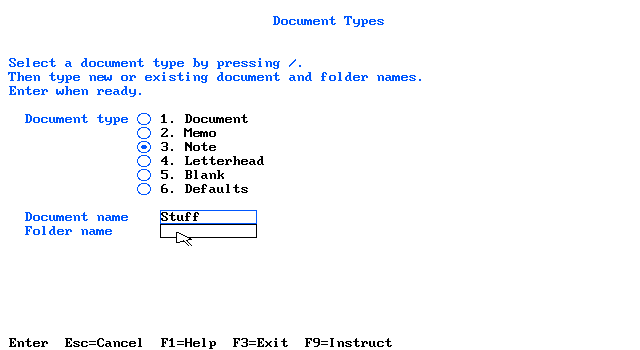 In this mode the "/" key is required for making selections. 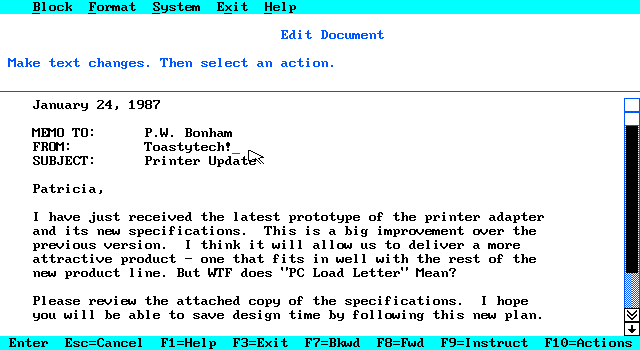 Terminal mode also simulates the response delays one might see on a real IBM terminal product. And exiting the program with a CUA pop-up selection box. Although the samples are rather crude, they demonstrate some of the basic Common User Access elements. It would be nice if the original related document could be dug up. A few of the later (~1991) documents are available on the web.